Callen Construction received two awards in the NARI Milwaukee-sponsored 2018 Remodeler of the Year Awards presented Jan. 18, 2019. The company was recognized with a Gold Award in the Residential Kitchen $60,000 – $100,000 category. 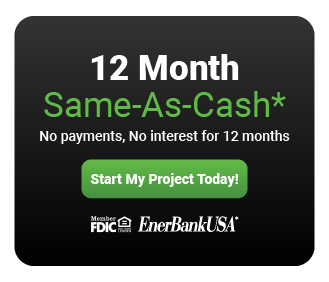 For the project, the retired couple’s main goal was to change their kitchen into a more functional space to accommodate both of them, as they wanted to share their love of cooking together. The husband, who grew up on a dairy farm, and the wife loved the rustic style, and the desire was to carry that feel throughout the first floor, which was addressed by adding two reclaimed barn wood accent walls in the kitchen and foyer. Christi Pryor (right), Callen Marketing Manager, receiving the NARI Milwaukee Service Excellence Award from Tess Bernardi of GuildQuality. The refrigerator was relocated and a full wall was removed to incorporate an island with seating for two. The stove was moved to the right of the sink, allowing for drop zones on either side of the stove plus an uninterrupted island space for multiple cooks. A small recessed pantry with roll out shelves was added above the basement stairs to maximized storage, with barn doors incorporated to tie in the rustic feel. 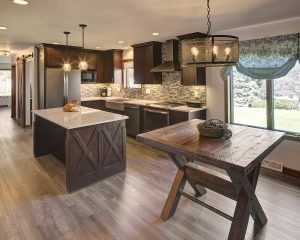 The Hazelnut-finish Cherry cabinets were complimented with quartz countertops, a cast iron finish farmhouse sink, luxury vinyl plank flooring, and a glass tile backsplash. In addition, Callen was presented with the NARI Milwaukee Service Excellence Award in recognition of the company’s outstanding customer service. 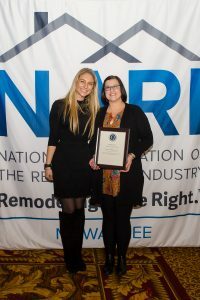 The award, presented in conjunction with GuildQuality, is reserved for NARI Milwaukee members whose customers have praised their work as being well above the standards of the building and remodeling profession. This is the 19th consecutive year Callen has won an award in the competition, which is conducted annually by NARI Milwaukee, Inc.